Mrs. Goldman has served as an adult educator in Jerusalem for many years in Torah learning centers such as Midreshet Rachel and Aish HaTorah. Through her love of teaching and sharing Torah with others, Mrs. Goldman has developed an innovative and successful method of using basic biblical grammar and textual skills to discover the beauty and intricacies of Torah. Using this method, Mrs. Goldman has created a condensed learning seminar, titled "A Taste of Torah Text,"ﾠwhich hasﾠbeen well receivedﾠin various communities abroad. How can we understand the text of the Torah? In this course we will develop grammar skills which are critical to translating and understanding the Bible. Each story is so much more than meets the eye. When we know how to read the text properly we reach new layers of meaning. This semester we will learn the story of David and Goliath to better understand the story itself and also to grow our skills in Torah study. The course is ideal for newcomers to Biblical text. How can we understand the text of the Torah? In this course we will develop grammar skills which are critical to translating and understanding the Bible. Each story is so much more than meets the eye. When we know how to read the text properly we reach new layers of meaning. This semester we will learn the story of Yehuda and Tamar to better understand the story itself and also to grow our skills in Torah study. The course is ideal for newcomers to Biblical text. In this course we will learn the story of the book of Yonah (Jonah) with a focus on skill development in the areas of grammar and translation. We will use the comments or Rash and Metzudat David to help us better understand the story and find what lessons we can learn from Yonah that is relevant to our lives. How can we understand the text of the Torah? In this course we will develop grammar skills which are critical to translating and understanding the Bible. In this semester we will learn Megillat Ruth in anticipation of Shavuot. The course is ideal for newcomers to Biblical text. Torah learning on WebYeshiva.org in Spring Semester 2017 is dedicated in the memory of Yehezkel and Sarah Lemel z”l by their loving family. יחזקאל בן אשר למל ושאשא יוכבד ז”ל ושרה מניה פייגע בת יום טוב וטשארנה רבקה ז”ל Click here to learn about their inspiring stories and passion for Torah education and Israel. To find out more about dedication opportunities with WebYeshiva.org please contact office@webyeshiva.org. How can we understand the text of the Torah? In this course we will develop grammar skills which are critical to translating and understanding the Bible. We will begin with text in Parshat Lech Lecha. The course is ideal for newcomers to Biblical text. Can one flee from God? What is the message of the Book of Yona – for Yom Kippur and for life? Develop your Torah skills in reading and understanding the text while you explore a deeper level of the story of Yona, which is traditionally read on Yom Kippur afternoon. A study for beginners of Jacob's sons' descent to Egypt, which ultimately led to the enslavement of the Jewish People by the Egyptions and their Exudus as a nation. This course will begin with Parshat Miketz (chapter 42 of the Book of Bereishit) and will focus on skill development to better read and understand the text. You are invited to develop your Bible study skills in this course for beginners. We will learn the section of the Book of Bamidbar (Numbers) called Beha'alotecha (chapter 60), with a focus on building reading skills and understanding the text. Beha'alotecha includes some of the following topics: lighting the Menorah in the Temple, the second Pesach offering for those who missed the first, and several stories about life in the desert those forty years. For previous classes with Mrs. Goldman on the same topic click here. Develop your Hebrew text-learning skills in this class while exploring the story of Jonah. In Kings I, Eliyahu the prophet goes up to Mount Carmel and challenges the prophets of Baal. In this course, we will discuss the lessons that he and the Jewish people had to learn from this incident. The course is for beginners to develop their skills in Hebrew grammar, translation, learning, and gaining deeper understanding of the text in order to learn how to take home the lessons of the story. In this shiur we will compare King Shaul and King David from many perspectives. The course will focus on skill development in reading and understanding text as we uncover these two dynamic personalities. Mrs. Osnat Goldman will be teaching an introductory course to Biblical Hebrew. By the end of the ten-week course, students should be able to recognize the Hebrew letters, identify their sounds, and navigate a page of Biblical text. Click here for the syllabus and source book. The cost of this course live $150USD. To pay, please click here. Note about payment: Full payment must be received before students will be granted access to the class. For questions about payment, please contact us at office@webyeshiva.org. There will be no refunds available. In this course we will develop the necessary skills for reading and understanding Jewish texts in Hebrew. To do this, we will look at excerpts from the Bible and learn to read and understand them using the commentaries. This course is meant for beginners who wish to grow. Develop your Bible-study skills in this course for beginners. We will learn the story of the Book of Shemot (Exodus) to build on skills of reading and understanding the text. For previous classes with Mrs. Goldman on this topic, please click here. 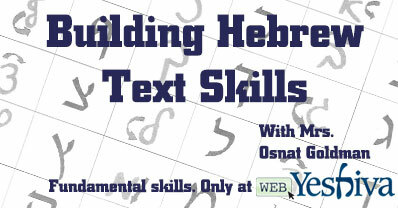 Continuing from the previous semester, we will take the next steps in learning skills for translating biblical Hebrew. We will look at a variety of texts to develop a better understanding of biblical grammar, and begin learning how to read and understand Rashi, a key commentator on the text. An introduction to the ancient Hebrew tongue, starting from square one. We will be learning skills for translating biblical Hebrew by looking at a variety of texts, developing an understanding of biblical grammar. Learn the story of Yaakov and Eisav while expanding your Torah-learning text skills by studying Rashi through the lends of the Midrash. Learn the story of Yaakov and Lavan in Parshat Vayetze while expanding your Torah-learning skills with commentaries including, Rashi, Siftei Chachamim and Ramban. This course is intended for beginning students and those with little experience learning Jewish texts like the Jewish Bible. The object of this course is to begin building an infrastructure of both grammar and textual skills for independent study. In this course you will learn more about how to uncover the roots of Hebrew words, learn vowel patterns, word constructions, vocabulary, and grammar fundamentals in the Jewish Bible. The course of study brings the learning of Hebrew texts down to a rudimentary level in an exciting and simple to understand way, enabling the student to easily grasp the mechanics of the language. The method will show how the language can be broken down, making it user-friendly, fun, and accessible to students of the Jewish Bible. This course is intended for intermediate students and those who already have some grasp of textual learning before starting Chumash with Rashi. The object of this course is to advance students' skills in both grammar and textual learning for independent study. In this course you will learn more about how to uncover the roots of Hebrew words, learn vowel patterns, word constructions, vocabulary, and grammar fundamentals. The course of study brings the learning of Hebrew texts down to a rudimentary level in an exciting and simple to understand way, enabling the student to easily grasp the mechanics of the language while studying Chumash with Rashi. The method will show how the language can be broken down, making it user-friendly, fun, and accessible to the student. This semester, we will begin learning the commentary of Siftei Chachamim. This course is intended for intermediate students and those who already have some grasp of textual learning and Rashi skills. The object of this course is to advance students' skills in both grammar and textual learning for independent study. In this course you will learn more about how to uncover the roots of Hebrew words, learn vowel patterns, word constructions, vocabulary, and grammar fundamentals. The course of study brings the learning of Hebrew texts down to a rudimentary level in an exciting and simple to understand way, enabling the student to easily grasp the mechanics of the language. The method will show how the language can be broken down, making it user-friendly, fun, and accessible to the student. Starting from our Winter Semester, we will be giving out Certificates of Completion for those who partake in this Tanach course. The certicate will be based on attendance and participation, and a short test to be given at the end of the semester. For more information, please email us at: office@webyeshiva.org. This course is intended for beginning students and those with little experience learning Jewish texts. The object of this course is to begin building an infrastructure of both grammar and textual skills for independent study. In this course you will learn more about how to uncover the roots of Hebrew words, learn vowel patterns, word constructions, vocabulary, and grammar fundamentals. The course of study brings the learning of Hebrew texts down to a rudimentary level in an exciting and simple to understand way, enabling the student to easily grasp the mechanics of the language. The method will show how the language can be broken down, making it user-friendly, fun, and accessible to the student. PLEASE NOTE: This class needs a minimum of 10 registered and paying students in order to ensure its continuation. This course is intended for students who have completed Journeys in Tanach: Beginners, or for those with some prior textual experience. The object of this course is to continue building an infrastructure of both grammar and textual skills for independent study. In this course you will learn more about how to discover the roots of Hebrew words; learn vowel patterns, word constructions, and grammar fundamentals. The course of study brings the learning of Hebrew texts down to a rudimentary level enabling the student to grasp the mechanics of the language. The method will show how the language can be broken down, making it user-friendly and accessible to the student. This class requires a minimum of 7 paid students in order to run. If registration does not meet this number, the class may be discontinued. This course is intended for students who have completed Journeys in Tanach: Beginners, or for those with some prior textual experience. The object of this course is to continue building an infrastructure of both grammar and textual skills for independent study. In this course you will learn more about how to discover the roots of Hebrew words; learn vowel patterns, word constructions, and grammar fundamentals. The course of study brings the learning of Hebrew texts down to a rudimentary level enabling the student to grasp the mechanics of the language. The method will show how the language can be broken down, making it user-friendly and accessible to the student. Please note that this is a paid course. The cost for the zman is $45 USD. Please make your checks payable to Mizrachi Organization of Canada. The object of this course is to begin building an infrastructure of both grammar and textual skills for independent study. In this course you will learn how to discover the roots of Hebrew words; learn vowel patterns, word constructions, and grammar fundamentals. The course of study brings the learning of Hebrew texts down to a rudimentary level enabling the student to grasp the mechanics of the language. The method will show how the language can be broken down, making it user-friendly and accessible to the student.